Definition of Financial Management and it's Origin Over Time. Financial Management is a significant activity of an organization what involves from funding money to controlling that fund usability. Financial Management In Business Dictionary defined as the planning, directing, monitoring, organizing, and controlling of the monetary resources of an organization. 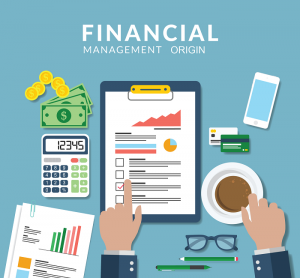 Defining Financial Management Ezra Solomon has described that Financial management is properly viewed as an integral part of overall management rather than as a staff specially concerned with funds raising operations. The process by which a person or enterprise is provided funding is known as finance.Finance is the science of funds management and deals with the study of investment. Finance has now become an organic function and inseparable part of our day-to-day lives.It exists everywhere, be it production, marketing, human resources or undertaking research activity. “The word finance refers to “all activities related to obtaining money and effective use.” – O. Farrell C. and Geoffrey Hirt. According to Business Dictionary, Financing is the act of providing money for a project. Actually finance is a branch of economics concerned with resource allocation as well as resource management.It is also the selection of best field of investment from various alternatives to maximize shareholders’ wealth.For that,money is the lifeblood of a business and finance is the center of nerve. It was a branch of economics till 1890 but has emerged as a distinct field of study at the turn of this century. Its evolution may be divided into three broad phases (though the demarcating lines between these phases are somewhat arbitrary). The phases are the traditional phase, the transitional phase, and the modern phase. The traditional phase lasted for about four decades. In this phase, the focus of financial management was mainly on certain episodic events like formation, issuance of capital, major expansion, merger, reorganization, and liquidation in the life cycle of the firm. The approach was mainly descriptive and institutional. The instruments of financing the institutions and procedures used in capital markets and legal aspects of financial events are belonged form the core of financial management. That time the Financial management was viewed mainly from the point of the investment bankers, lenders, and other outside interests. The transitional phase begins around the early forties and continues through the early fifties. Though the nature of financial management during this phase was similar to that of the traditional phase, greater emphasis was placed on the day to day problem faced by the finance managers in the area of funds analysis, planning, and control. These problems however were discussed within limited analytical framework. The modern phase begin in mid 50’s and has witnessed an accelerated pace of development with the infusion of ideas from economic theories and applications of qualitative methods of analysis. In this phase the scope of financial management has broadened. The central concern of financial management is considered to be a rational matching of funds to their uses in the light of appropriate decision criteria. The approach of financial management has become more analytical and quantitative in times. The point of view of the managerial decision maker has become more dominant. Since the beginning of the modern phase many significant and seminal developments have occurred in the fields of capital budgeting, capital structure theory, efficient market theory, optional pricing theory, agency theory, arbitrage pricing theory, valuation models, dividend policy, working capital management, financial modeling, and behavioral finance. From Mawlana Bhashani Science & Technology University.